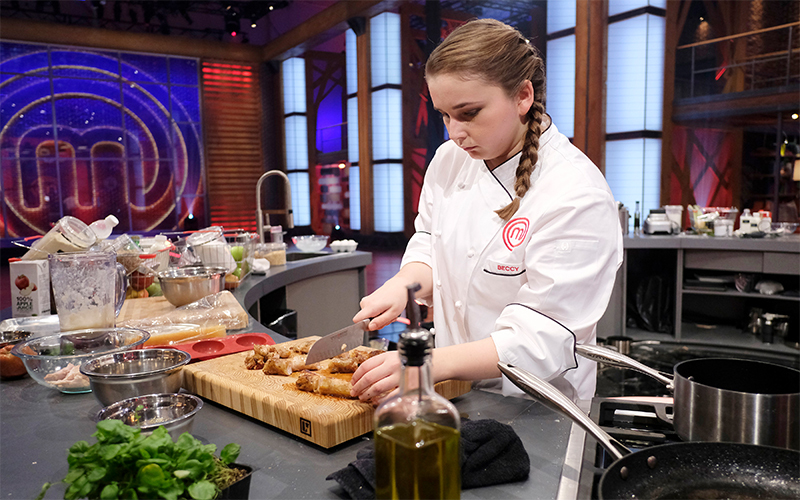 MasterChef Canada: And the winner is… | TV, eh? It was the moment we were waiting for! The MasterChef Canada SEASON FINALE! Two home cooks who deserved it all, battling it out. What could viewers expect? An incredible end to the great season! Andy and Beccy were supported by their loved ones and friends and what could make them more confident than that? The home cooks had three hours to complete three courses: appetizers at the first hour mark, entrées at the second and desserts at the very end. The catch? The clock rolled the whole time and Beccy and Andy had just 10 minutes in the pantry to get everything they needed. Andy wanted to show the judges his roots and went very East Coast with his menu. Beccy was inspired by British classics with an apple twist. Chefs Claudio, Alvin and Michael were excited to see what these talented cooks would make. And the show began! Both menus sounded incredibly delicious, but the taste was the most important part. Andy and Beccy were moving FAST! Beccy’s potato nests were in danger because of the sweet potato she used. Andy seemed very confident and his process was easy for me to watch. Beccy made a Scotch quail egg on a nest of potatoes and parsnips as her entrée. The presentation was beautiful and looked very natural, but the potatoes were a little burnt. The Halifax Donair salad with lamb, pita chips and Tahini dressing from Andy was a spot on. The flavours were amazing. Time for the main course. The heat in the kitchen rose. Andy was running all over the kitchen while Beccy was totally chill. Chefs Claudio, Alvin and Michael started with Beccy’s rabbit two ways on a Jerusalem Artichoke purée. The cook on the meat was perfect. Andy made an elevated hodgepodge with Dungeness crab, sweetbreads, onion soubise and crab bisque. The dish was very colourful, but was it a main course? Finally, the home cooks worked on their desserts. With just one hour, it was a lot of work. Then it was time to taste the dishes! Beccy and Andy were relieved, because the cooking was done. Up until then, the judges liked all of the dishes, but the desserts made the game. Fallen apple with a gelée core on a soil of dried fruits and nuts was Beccy’s way to end her three-course meal. The only thing that was missing was the glaze. But was it a mistake or an advantage? Andy made a Newfoundland toutons with a malted pastry cream, brown sugar and bruléed rhubarb. The judges loved the flavours of his dessert. After all that, it was time to crown the winner of MasterChef Canada! The home cook who won the trophy, $100,000 and the life-changing title was … BECCY! The youngest winner in franchise history! I was #TeamBeccy for sure! Who was your choice? Let me know in the comments below! Not Beckey, no more MasterChef Canada for me. Not Beccy .. although totally could have predicted it. I wish they would stop making it so predictable … they are ticking boxes .. I am so happy for Beccy as I was cheering for her from the beginning. She really was cool as ice in all the competitions and she face difficult situations. I have watched every episode and watched all the past seasons and I can’t wait for another season. Way to go Beccy !! I loved watching how calm and confident you were in each challenge !! I was pretty confident that you would win . You have demonstrated that you will go places in this line of work !! I thought it would/should be Beccy since early on… it’s rather cool to see I had picked the ultimate, actual, winner. She did, indeed, deserve the win. Hell of an accomplishment, especially at 19 w/out formal training nor professional cooking experience behind her. The others were talented, too, but, Beccy’s vision, ideas/concepts & intelligent, intuitive execution make stand out from the crowd. She will, certainly, excel and make a name for herself. I thought it would/should be Beccy since early on… it’s rather cool to see I had picked the ultimate, actual, winner. She did, indeed, deserve the win. Hell of an accomplishment, especially at 19 w/out formal training nor professional cooking experience behind her. The others were talented, too, but, Beccy’s vision, ideas/concepts & intelligent, intuitive execution make her stand out from the crowd. She will, certainly, excel and make a name for herself. NB: Saw no Edit & there was an important word missing. Thanks for your understanding & for appreciating the ‘correction’. Most definitely agree Beccy was forecasted to win based on her story, age, and the air time she was given. She kept her cool each week and appears to be born to cook. I liked Andy’s dishes better in the finale but know he will do well in his own restaurant without the added benefit of winning the title. Both were great competitors and exuded a lot of class. I disagree with some of the comments made that Beccy’s win was predictable and that she was given more air time. I thought Andy had more air time than her. I believe it was neck to neck between Beccy and Andy until the very end. Beccy won because she had the slight edge over Andy due to her innovative cooking style and smartness. Congrats Beccy! I hope to taste your cooking one day !!! We have been watching this season not skipping even one episode from beginning to end. SoooOooo awesome that Beccy won & so deserved!!!!! Andy was amazing as well but everyone has their pick and ours was Beccy. Am very pleased that Beccy won you could see from the very first show that she was a gifted chef. Was so cheering for Andy but it was predictable that Becky would take it…..would LOVE Andy to come out with a cookbook! Been out east and the food is amazing! Want some of your recipes Andy! Becky – First one in her family to finish high school, never been in a fancy restaurant, never seen most of the ingredients but so talented that I cannot understand any negative comment here. Andy was also great cook but I agree 100% with the judges that Becky is the winner! Congratulations Becky! I didn’t think a Beccy win was inevitable at all. Even last night, I had a feeling that Andy was going to win. I was surprised when she did. I would have been happy either way. They both proved themselves, worthy adversaries, throughout the competition. I’m sure both will do well in the future! I was rooting for Beccy right from the first episode. She went about her business quietly and didn’t brag nor did she make any disparaging comments about her fellow competitors. You’ve nowhere to go but up, Beccy! Sincere best wishes for your future. Great choice . Pretty amazing for a 19 yr old & she earned it.She worked for that win & it was not handed to her. Congrats to her. Throughout the series I though that the judges were a bunch of pretentious wankers.The amount of dribble that came out of their mouths made me want to vomit. As for the judge last night saying that he didn’t want to see Beccy’s Scotch Eggs hard….doesn’t he know that Scotch Eggs are meant to be made from “HARD” boiled eggs….I rest my case. Team Beccy, all the way. She was strong from the start and yet so shy. Oh my ! My husband and I are so happy for Beccy. She worked so hard and stayed calm but showed grit and determination. I was so stressed I couldn’t watch it so waited till today to find out. Hopefully we can taste her cooking in the near future. lmao what a scripted show, andy did better in the final, masterchef canada what a joke. There was actually a show w here beccy was not feature at all other than the occasional pass is the camera. For the folks that say it was scripted you can not script plating like that. I think the difference in the final was Beccy had a very elevated dish and Andy served hash.